In this lesson, we will learn about the area of a triangle. Learn about the formula for the area of a triangle. See an example on using the formula to find a triangle's area. See another example on using the formula to find the height of a triangle. Note that, this formula only works if the triangle's height is perpendicular to its base. The study tip and math video below will explain more. Area of a Triangle from MathExpression.com on Vimeo. First, let's consider this parallelogram with the base B and the height H.
Now, in the previous lesson, we learned that the area of a parallelogram, A = BH. 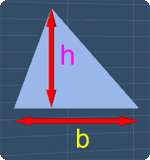 Observe that, if we cut this parallelogram by half, and remove this portion, we now have a triangle with the base B and height H.
Since the area of this triangle, is half of the area of a parallelogram, the formula for the area of this triangle, A = 1/2BH. Find the area of this triangle when its base is 5cm, and its height is 4cm. First, we start with the formula for the area of a triangle, A = 1/2BH. Similarly, since the height is given as 4cm, we can substitute H with 4. Next, we can simplify by multiplying 5, with 4. This gives 20. Note that, one half bracket 20, can be rewritten as, 1 bracket over 2. Let's continue. 1 multiply 20, gives back 20. 20 divides by 2, gives 10. Hence, the area of this triangle is 10 square centimeter. Next example, given that the area of this triangle is 24 square feet, and its base is 6ft. Find its height. Again, we start with the formula for the area of a triangle, A = 1/2BH. It is easier to work with this equation if we rewrite this term, one half BH as, 1 BH over 3. 1BH is the same as BH. Next, note that we can remove this fraction, by multiplying both sides of the equation with 2. By doing so, we have, 2A = BH. Next, since the area is given as 24, we can substitute 'A' with 24. 2 multiply by 24, gives 48. Similarly, since the base is given as 6 feet, we can substitute B with 6. Now we have, 6h equals to 48. To find h, we need to remove 6. We can do so by dividing both sides of the equation with 6. By doing so, we have, H equals to 48 over 6. 48 divides by 6, gives 8. Since the base is in feet, the height of the triangle will be in feet. Therefore, the height of this triangle is 8ft. You can start by going through the series of questions on the area of a triangle or pick your choice of question below. or pick your choice of question below.